We're keeping up with both the Wild-Jets game in the Stanley Cup and the Wolves-Nuggets elimination game for a spot in the NBA playoffs. The latest updates and more are here. 47 wins, 16 game improvement and the first playoff trip in 14 years. It was seldom pretty but it was effective. And that game was fun. MIN protects home court in the winner take all clash and defeats the @nuggets 112-106! This is their 1st trip to the playoffs since the 03-04 season! Wiggins redemption. Was 3-6. Canned both FTs. Big smile. This one verrrry close to over. Andrew Wiggins sinks both and it's a two possession game! @timberwolves 110 | @nuggets 106 - DEN has the ball. The @timberwolves come up big defensively and Wiggins will shoot two free throws! Jeff Teague with the clutch bucket in OT! @timberwolves go up 1 with 1:08 left in OT! 107-106 Wolves. 1:08 remaining in OT. Jimmy Butler makes two free throws and Millsap makes a layup! Jimmy Butler makes two free throws! Will Barton nails the 3 and the @nuggets take their 1st lead since the 1st quarter! Jamal at the buzzer... and it's short! WE NEED 5 MORE TO SETTLE THIS ONE! OVERTIME ON THE WAY IN MINNESOTA WITH A PLAYOFF SPOT ON THE LINE! @nuggets 101 | @timberwolves 101 after regulation. Taj Gibson strips it away! @Timberwolves call a timeout with 1.6 seconds left! The @nuggets get a ****! 4.4 on the clock and DEN has possession with the game tied at 101! I love Butler but Butler hero ball is problematic now. Probe and use all the talent. Jamal Murray steps back and lets it fly! @nuggets 101 | @Timberwolves 101 with 2 minutes left. @Raptors & @MiamiHEAT are tied at 102! 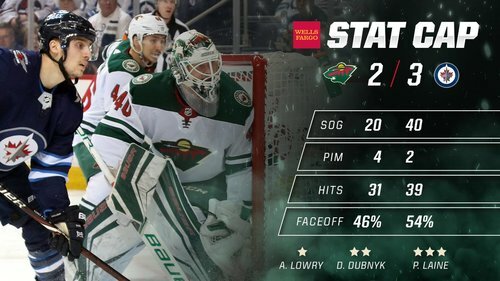 Can we go back an hour ago when the wolves led by 8 at halftime and the Wild was up 2-1 in the third? Shane Larkin excites the @celtics crowd with the corner triple! Refs are compensating. Murray deserved an and1 and Taj took down Milsap to enable possession that ended w/Teague trey. 99-91. GAME 👏 WINNING 👏 GOAL! 16th sellout of the season.